Here's a great gift for the Steve Jobs fan on your holiday shopping list, the newest action figure of the late co-founder of Apple made by Legend Toys. For $199.99 (the same price of an Apple iPhone 5 on contract), you get the 12 inch detailed figure, glasses, sofa, a small Apple and three pairs of hands. 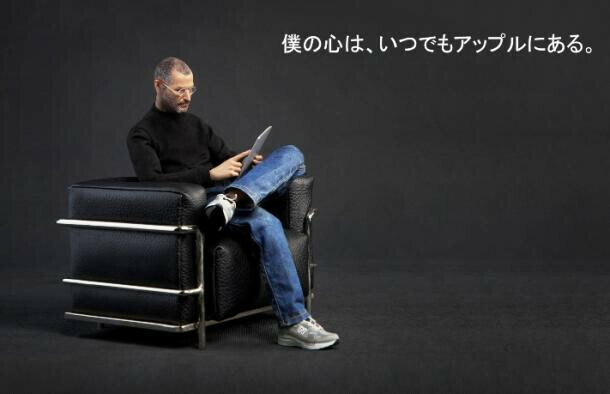 It is an older Jobs than the figure made by Japanese company In Icons which was pulled from the market after complaints from Apple and Jobs' family. The 12 inch figure is done at a scale of 1:6. Legends' Yuichi Kimura says that the company did not obtain permission from anyone to produce the figure, and says that it believes none is required. Of course, words like that were probably uttered by Samsung executives at one time or another, and look where it got them. $199.99? I'm sorry but if someone was an Apple fan, they obviously would just buy an iPhone 5 on contract. Dude, ur whole sentence is WRONG!!!!!!!! what are sayin exactly?!? did u have mushrooms for breakfast? he was and still is the cheapest Executive of any company in the history of humanity! being at the position he was, he declared to go at THERMONUCLEAR WAR against android... for what? he said android copied apple's os. well did he prove that? NO! even until today apple could not prove that! the case thats going on is against Samsung, NOT GOOGLE! he died crying about his lie and even today his company is only and only filing cases against OEMS of android and not doing anything REVOLUTIONARY for their own OS. its very pathetic that apple has not filed A SINGLE CASE against GOOGLE itself for ANDROID... this piece of s**t above, is not worth a penny! just from this guy's name, he's obviously a troll, stop feeding it! "Legends' Yuichi Kimura says that the company did not obtain permission from anyone to produce the figure, and says that it believes none is required." Best thing I've read all day! Haha. Finally, we will get to see if Steve Jobs was anatomically correct. This will be a great addition to my action figures: I'm gonna' put my newly acquired Steve Jobs with my Michael Jackson action figure in Barbie's DreamHouse and let them play iHouse whilst listening to the Thriller album and moonwalking as the two 'Beat It'! Steve blwjob dosen't even stand a chance near his foot, letalone be in the same league! This guy dosen't deserve to be going to heaven? seriously? well, ok, I am sure of their cult members from san fran would buy it. Another step to the apple religion? Or the sect, I would rather say. Do bring your money for your Lord into apple store, apple user! Jobs is watching you. If anyone I know asked for this, I would get them a spring loaded boxing glove in a box that would punch them in the mouth when opened. "Our Steve who art not in Heaven*, sensationalized be they name, your patents come, your thermonuclear war be done, in the USPTO as it is in the ITU. Give us this day our incremental annual update. And forgive us our 'holding-it-wrong', as we have also forgiven 'it's-a-feature'. And lead us not into Android, but deliver us from Google." 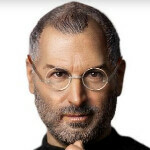 - The Book of Jobs *As a Buddhist, Steve would have preferred reincarnation.